The images on the page combine to create a stirring testament to the power of the storms and the lives they affected. (CNN) -- A group on Facebook has created a page to try to link victims of Thursday's tornadoes with photos, documents and other personal effects blown away in the storm. 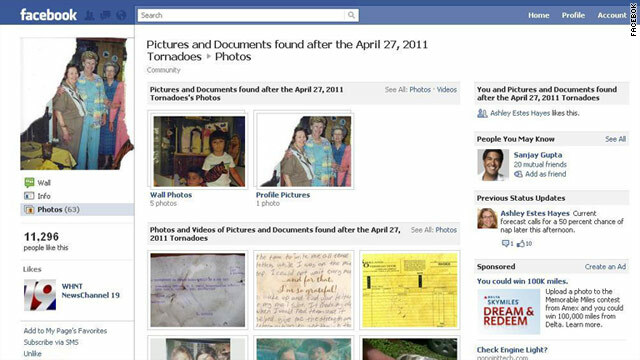 The page, called "Pictures and Documents found after the April 27, 2011 Tornadoes," lets members post photographs of things they've found, along with their e-mail addresses, in the hopes that items of value may be reunited with their owners. The page was created Wednesday evening. As of Friday at 5:30 p.m., it had more than 50,000 "likes" and displayed more than 600 images of found items, including a child's Raggedy Ann blanket; a Tuscaloosa County, Alabama, mortgage document; and an ultrasound image of a fetus. "Please post pictures or pictures of other items that were found as debris after the 4/27/2011 tornadoes," it reads. "Please leave a brief description of how someone can find you if they identify pictures or items that belong to them." The missing items were presumably blown away by the storms that tore through Alabama and other Southeast states late Wednesday and early Thursday, killing more than 270 people and devastating entire towns and neighborhoods. 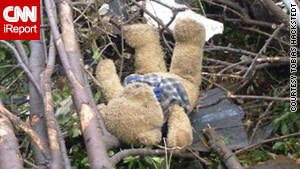 A CNN iReporter posted this photo of a teddy bear lying in debris in tornado-ravaged Tuscaloosa, Alabama. The page's creator, Patty Bullion, said the inspiration for it came when the worst of Wednesday's storm flew pastabout 10 miles from her home in northern Alabama. "When it went over us, it literally just started raining pictures," she said. "We got parts of Bibles, hymnals. ... I just started saying, 'There are parts of people's lives falling out of the sky.' "
Bullion said that, as of Thursday afternoon, 13 documents had been identified and were on their way to their owners. But the items posted to Facebook have another, less practical purpose. When viewed as a gallery, the images combine to create an oddly stirring testament to the power of the destructive storms and the lives they affected. A group of young soldiers in desert camouflage poses for the camera in one photo. Another is a scratched and apparently rain-dotted shot of a beauty queen and her mother. One signed yearbook page, apparently from the '60s, shows a group of boys eyeing a female classmate. A snapshot of a shredded receipt from Smithville, Mississippi, was posted by a user in Franklin County, Alabama. "You just know these are prized possessions to people," said Bullion, who had planned to begin work at a local council on aging this week before getting delayed by the storms. "If they've lost everything and could just get one picture back, I know that would mean a lot to me." Sometimes, the poignancy on the Facebook page is direct. "This check belongs to my brother in law's father. (The signer of the check) passed away in the tornado. I know it would mean alot to his son and wife to get that back." Another user's raw emotions were apparent in her post about a photograph of a shredded receipt. I am praying for (the person whose name was on the receipt)," she wrote. "I don't know him but I am praying he is safe. I found this receipt in my front yard this morning. I live 58 miles away in Crestline in Birmingham. "Alabamians are suffering and displaced and I pray that they find a way to put it all back together again. I don't know if this is important for him, but it has affected me deeply." Anyone who has found valuable personal items in the aftermath of the tornadoes may also post photos or video of them to CNN iReport.